It’s just eight more days until Valentine’s Day. Can you believe it? 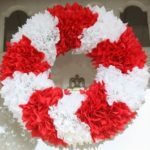 This year’s red and white mantel theme started with the chevron wreath that I crafted using dollar store napkins. I hung it on my door and immediately realized that the wind or the elements would destroy it. Inside it came where it found a home as the centerpiece for this year’s Valentine’s Day mantel. The red vases and the two white Fire King vases toward the center of the mantel are all finds while shopping in Vermont. 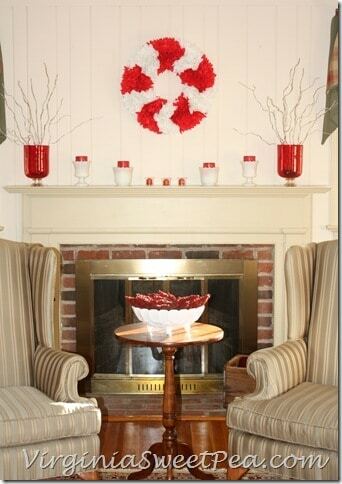 I’ve had the red vases for many years and found the white ones on our Christmas Vermont trip. 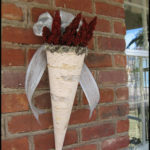 Curly Willow from my yard spray painted silver fills the red vases. 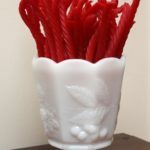 The white vases and clear votives hold red candles that have a wonderful scent. My dad harvested this red sumac for me nearly twenty years ago. Isn’t it amazing how well it has kept its color over the years? 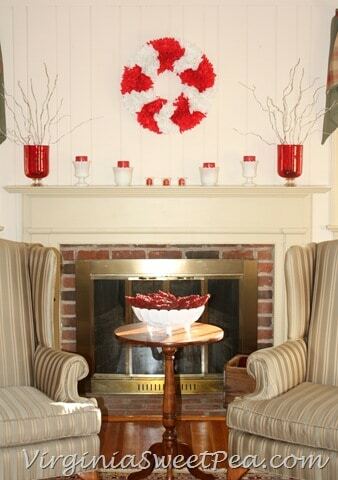 The music stand to the left of the mantel and the marble topped table to the right of the mantel give me plenty of other spots for Valentine décor. My grandfather made the heart basket for me when I was in college. For years it was on my desk where it held important papers. If you are over 40, you probably remember when hearts were the rage in decorating! I found this darling Valentine on one of my spring dumpster dives. 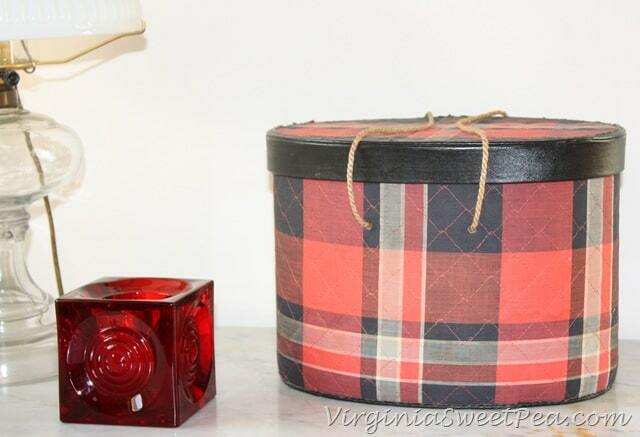 A red candle holder and a vintage tartan sewing kit decorate the table to the right of the mantel. Both were passed on to me by my grandmother. 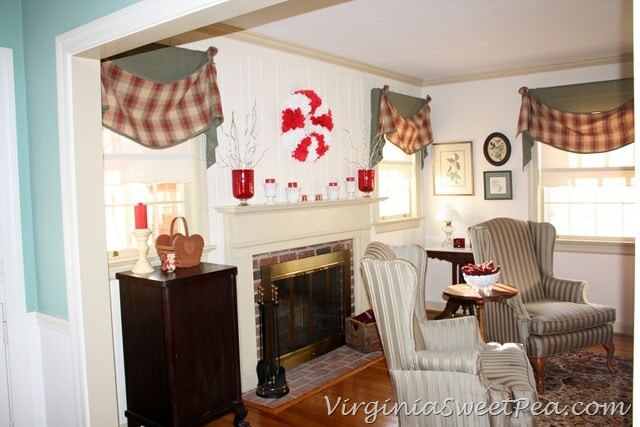 I’ve had a lot of snow days off in 2014 and it’s been so nice to be home during the day to enjoy my decorations. They just aren’t quite as brilliant at night. Don’t forget to enter the $475 PayPal giveaway! 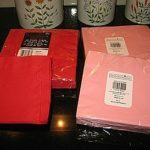 It doesn’t take long to enter and someone is going to be a happy winner and it just may be you! 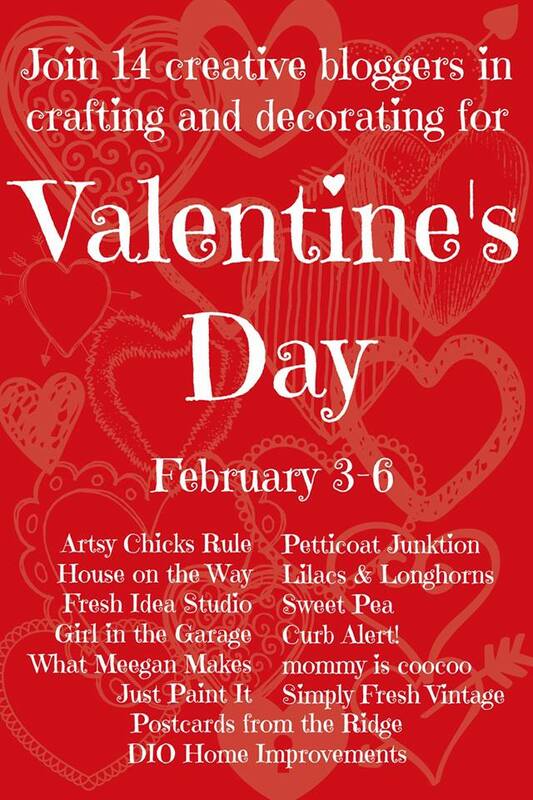 I’m pleased to join 14 blogging friends for a Valentine’s Day Tour tour this week. 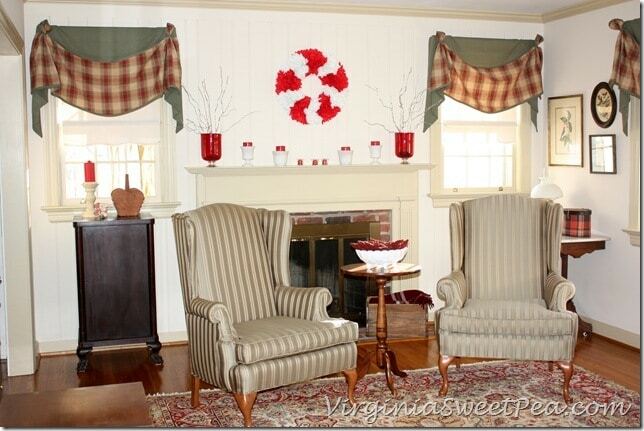 Be sure to stop by the participating blogs for crafting and decorating inspiration! Previous Post: « $475 Valentine’s Day Cash Giveaway! 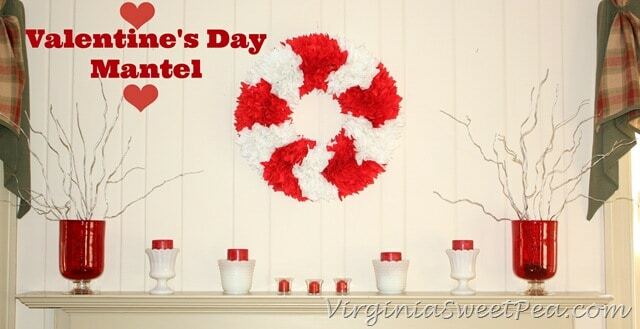 Don’t you just love a Valentine’s Day Mantel?! So pretty! Have an awesome weekend and it’s been a pleasure to be on this tour with you! 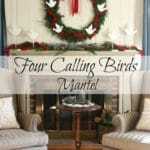 You are always so great in decorating your mantle! It looks fabulous. I think this may be my favorite yet. The red looks amazing on that white wall! Sweet Paula! 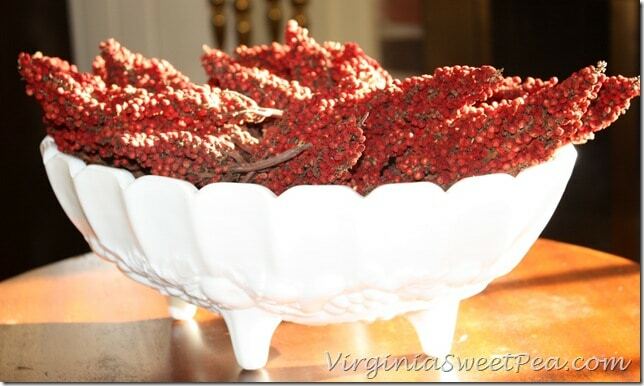 Love the red sumac, so glad you still have it and it still looks so pretty! 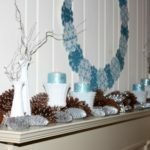 Your mantel looks so festive Paula! I love that your decor holds special memories. Happy Valentine’s Day to you! Paula, YOur mantel is so pretty. I love that you have so many things from your dad and grandparents. 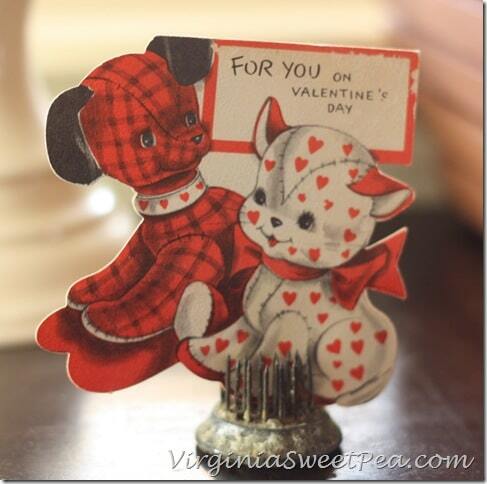 The vintage Valentine card is too cute. I think you and I should go thrifting together some time! I so remember all the hearts in decorating! 😉 I just love all of the meaning that your decor holds! I think that is the best! 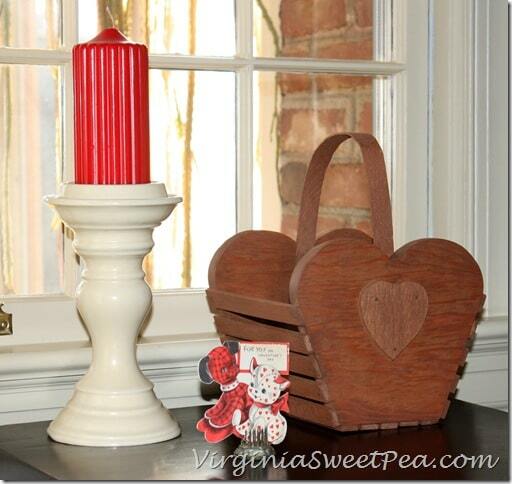 Love your sweet Valentine mantel Paula! And oh my goodness where have I been? I’ve never hear of red sumac before?! Very cool. I like it. Love it Paula!!! 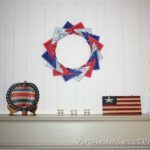 I pinned the mantel. Beautiful! By the way…photos are fabulous! Beautiful mantel Paula!…Have a great weekend! I love your mantel and tables. They look so fresh and interesting. What I really love about your decorations is that you always have items from your family. That makes it all so special.